ALSO: KEEP THE VOTE/NO TAKEOVER MEETING, TUE. SEPT. 4 AT 6PM, 11825 DEXTER CENTER. 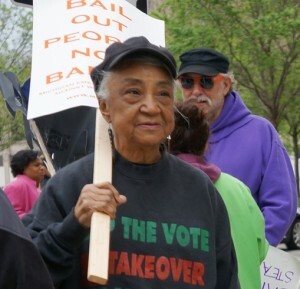 Elder Helen Moore of the Keep the Vote No Takeover Coalition protested the devastation of Detroit Public Schools through bank debt that has drained district of per-pupil funding. From Helen Moore: Why are the news stories only saying the contaminated water is in DPS’s? What about the charter schools who bought the schools from DPS. What about the other buildings in Detroit that have been there for years? How long has our water been contaminated? Who is covering up this crisis? We the People of Detroit and Welfare Rights have been warning us for years to no avail. We need answers and we are going to find out what has been covered up!!!!!!! IF YOU HAVE ANSWERS, ATTEND THE KEEP THE VOTE/NO TAKEOVER MEETING. LET’S ORGANIZE BEFORE IT IS TOO LATE! COALITION RELEASE: The recent announcement that drinking water in all of Detroit public schools is being shut off due to the water supply being contaminated with toxic levels of lead and copper reflects a crisis of immense gravity. It comes at a time when the Detroit Public Schools Community District has no funding supply available to effectuate the $500 million in repairs they acknowledge are needed to insure the safety of the students. 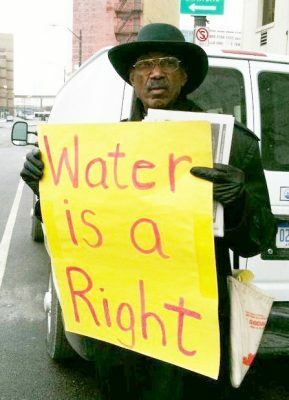 The late Tashi Kiya at protest against water shut-offs in Detroit. Copper and lead contamination in drinking water can cause permanent brain damage, kidney problems and retardation of physical growth, and is toxic to every organ in the human body. Children are particularly vulnerable to its effects. Teachers who came to work last week in preparation for the school year found themselves working in schools with no operating water fountains and no bottled water being supplied. They have received no information as to how much water will be supplied. In some schools such as Gompers, the water was completely shut off in the entire building last Wednesday, with no water provided to staff to wash their hands or flush toilets. There are reports that the air conditioning is off in the elementary wing of John L. King. Even when the water fountains are shut off, toxic water is still running in sinks and toilets for flushing. If students ingest that water, they are subject to the dangerous longtime effects of lead and copper poisoning. These issues are not new. 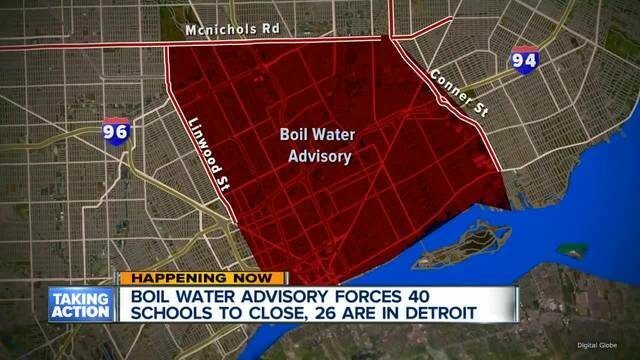 On April 16, 2016, 19 DPSCD schools had their drinking water shut off due to dangerous levels of lead and/or copper in the water supply. The bottled water that was supplied was one four-ounce (half-cup) bottle to each child per day, far below the amount of water needed. Despite the drinking water not being turned on through the summer months, the supply of bottled water was terminated after about one month. In August 2016, the water was turned on via a big public relations announcement that nearly all DPSCD schools buildings were safe. But after a couple weeks, new testing showed the water was still toxic and water had to be shut again to many of the schools, with the result that the students had been fully exposed to toxic water during that time. The DPSCD has been cited and fined for its toxic water supply by MIOSHA over the years. Superintendent Vitti acknowledges that problems with the infrastructure are likely responsible for the toxic water in Detroit schools. Last June the DPSCD estimated that the repairs would cost $500 million. But under terms of the state “bailout” the district has only $25 million available for repairs and no authority to raise funds. There has never been an audit of what happened to the $2 billion that was raised for infrastructure repair under state oversight. With these overwhelming structural problems in the schools, it is not hard to understand why recent tests reflected that only 11.3% of 3rd grade DPSCD students were proficient in English Arts and only 10.7% were proficient in Math. Called by a Coalition of Water Activists including People’s Water Board, Welfare Rights Organization, Moratorium Now Coalition, and many others – Call 313-319-0870 for info. It is questionable whether it is only the DPS infrastructure at fault here. The same excuse was given for the lead poisoning of the entire city of Flint, when in fact it was directly related to Gov. Rick Snyder and his Flint Emergency Manager, who ordered that Flint separate from the Detroit Water and Sewerage Department (DWSD) system, in anticipation of the creation of a duplicate pipeline by the profit-hungry Karegnondi Water Authority. Eventually, Flint was forced to reconnect to Detroit’s system, but the Great Lakes Water Authority had already taken over the DWSD. 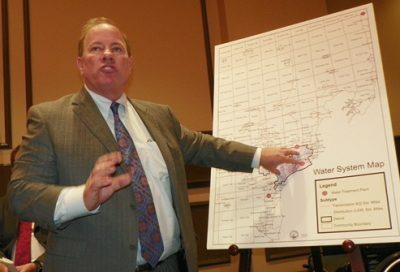 Ever since that takeover, sanctioned by Detroit Mayor Mike Duggan and the Wayne, Oakland and Macomb County Executives during the Detroit bankruptcy proceedings in 2014, there have been constant “boil water alerts” throughout the six county region originally governed by the DWSD. At least 41 percent of DWSD workers were laid off prior to the takeover, including sanitary chemists who monitor the water for health and safety purposes. Management announced it was combining their duties with those of lower-paid operators, who had no specializing training and even had to be given remedial math education. Under the GLWA, things have worsened greatly. The DWSD operates only a small part of its original system, minor pipelines within the borders of Detroit. All wastewater treatment plants, other facilities and major pipelines are run by the GLWA, a regional takeover of breathtaking proportions since DWSD originally provided water to 40 percent of Michigan’s population. No doubt the Detroit Public Schools infrastructure has deteriorated over the years as huge chunks of its public revenue went to pay off its debt to the banks, but it cannot be the only cause of this latest greed-driven crisis. The Voice of Detroit is planning an update on this latest crisis, which will include the Michigan Employment Relations Commission decision to affirm the layoffs of DWSD chemists. But we are struggling to stay afloat right now, (no pun intended), and desperately need whatever people can afford in donations to the newspaper. Voice of Detroit is published pro bono. You don’t have to pay to access our stories. But there are substantial out-of pocket costs associated with its publication. Currently we are running in the red, so any donation amount is much appreciated. Donate by clicking https://www.gofundme.com/VOD-readers-up. 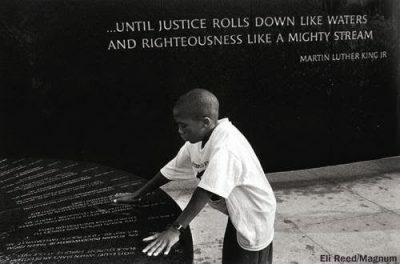 EVER SINCE DETROIT WAS TAKEN OVER BY ***AUTHORITIES*** OUR QUALITY OF LIFE HAS BEEN ON A DOWNSLIDE ?? IF “THEY” KNOW SO MUCH MORE THAN “US” AND HAVE MORE SKILLS, THEN WHY DO “THEY” PERFORM SO MUCH “WORST THAN US” IN EVERYTHING THAT THEY AQUIRED / GAINED CONTROL OVER ???? ?